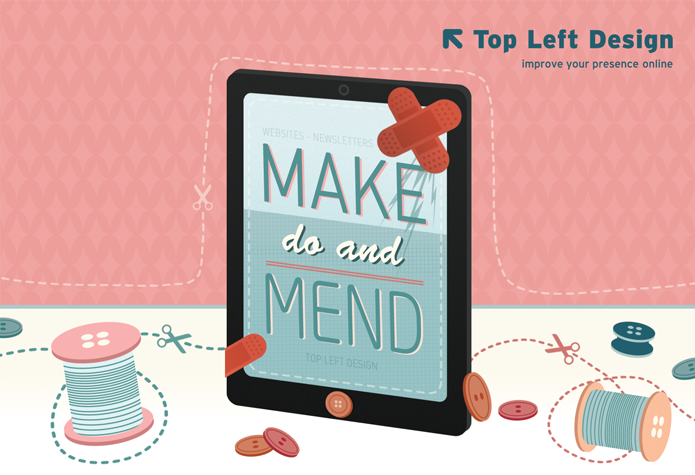 Top Left Design January 2012 News - Make Do and Mend! It's nearly the end of January - and despite being a "long month" (31 days, with a Chinese New Year inside of it) it seems to have flown by. January is a time for new beginnings but also, after the excesses of the holiday season, typically a time where people are cautious about spending money. So, we decided to support this with some tips on how to save money and still "improve your presence online". Did you know, at Top Left Design 53% of our work is actually making changes and updates to existing websites? This is not only on websites we have built but we are even able to keep websites that other people have built updated. We like doing this work, and want to do it more. It's all within our ethos - making things better! There are lots of things you can do for free or within just 5-10 minutes that can help you look better online. New Year's resolutions shouldn't just be about bettering your own personal appearance, it should also be about bettering your online appearance. Here are 8 free, or almost free ways to "Improve your presence online"
Update your vanity URL on LinkedIn. To do this, go to Edit Profile, click on "Edit" next to where it says "Public Profile", then under Your Public Profile URL (on the right side of the page) click "Customise your public profile URL" and edit this in the popup window. Usually your full name is good, otherwise, if that's taken by someone else, just choose something with a keyword. For example we added "huwgriffithsacupuncture" at the end of Huw's profile - making his new URL http://uk.linkedin.com/in/huwgriffithsacupuncture instead of the funny default gobbledygook. There is even a video by our friend Alicia Cowan on how to do change your LinkedIn vanity URL! Fill out your bio on Twitter. A lot of people skip this or don't bother. Really use those 160 characters and make sure you sound friendly and it's clear what you do/are all about. To do this, sign in, go to "Edit your profile" and fill in the box called "Bio". Don't be an egg - you have heard this before, make sure you upload a proper image of yourself on Twitter and ALL your online profiles! Learn about headline writing. If you have a blog, there are lots of ways to write headlines which are more likely to compel people to read your blog, and to share your blog around. Check out Copyblogger's 11 part series about "How to Write Magnetic Headlines" - www.copyblogger.com/magnetic-headlines. Check the "TITLE" tag in your website. This is the text that shows up at the top of your browser when you visit a website page. It's also taken from a small line of code in your site page. Search Engine's look at this as one of the things they rate pages for keywords. It's a 5 minute job to change this, it looks more professional and it's good for SEO. Email us with your telephone number if you want us to talk you through this on the phone (no charge). Go through your website and make sure any PDF files and links to other external websites open up in a new window. This again is a 5 minute job to change, and it's much more user friendly as it means people don't have to press the "Back" button to get back to your website. Go through your website and make a "snagging list" - a wish-list of changes that you would love to do, if only you could afford it. Send this to us and we can tell you if any of the things on it are so quick you could do it yourself, or it could be that the change would take us under an hour to do. Take up one of our 3 offers below - we only do this type of thing in January - otherwise known as The Month of Austerity. Free snagging list (with up to 15 things we find which we recommend you can improve) - sent in a special report! 20% off your maintenance, newsletter or blog - just email us and we can give you a call to go through options. Get our free e-book - if you haven't got it already - visit www.topleftdesign.com/freebook. 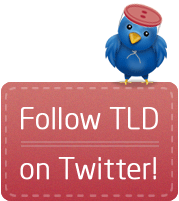 To qualify please email us with the code TLD-MAKEDO+MEND and your choice of the above three options. Thanks & Recognition provide support to management and employees to achieve a high performance culture. They help to create an environment of trust where people feel empowered to thank one another for good deeds they have done in the day. The site is built in HTML/CSS and has a WordPress blog. We used fading statistics on the home page and also embedded the Thanks & Recognition's "Yum Yums & Employee Engagement" video which is a big hit in the Top Left Design office! There is also a blog feed integrated on the home page. We love the Thanks & Recognition theory so much we even wrote a blog post about the new site! Montagu Financial Management provide financial planning and employee benefits services to private and corporate clients, based in London and the South East of England. This was a project brought to us by the lovely Abbie Tanner from A Business Innovation. Montagu wanted a crisp, clean website which was easy to navigate. They chose to include quirky images and testimonials throughout which is a great way to make your company more credible. The design of the Montagu website came quite easily after we hade created their lovely new logo. Mount Sterling Wealth are an independently owned financial planning and wealth management practice with offices in Mayfair and North Yorkshire. This was another project that we did along with A Business Innovation. Mount Sterling Wealth wanted a simple, professional website that ensured that all their information was easily accessible. It's only a 3 page site but it really packs a punch we think. The site makes use of a great sliding header which features some of their testimonials, its also has downloable PDF versions of their case studies and you can find their team members details through the links on the site to ContactMonkey. Plexus Consultancy Ltd specialises in the provision of bespoke security services to clients in the global energy, communications, shipping and transport industries. We came to work with Plexus through our good friend and talented marketing specialist Tamsin Fox-Davies. The website needed to be professional and strong looking while still being welcoming and accessible. As you can see we drew our inspiration for the website from the colours of the logo. On the home page you will be able to immediately see the services they offer along with attractive images, and these lead you to the services page where we used a cool expanding script! Rosie Millard is a journalist, broadcaster and author. As well as her newly launched website, Rosie also has a mummy's blog which we launched in June 2011 called Helicopter mum. Rosie wanted a vibrant, contemporary and professional website which promotes her writing, journalism and shows her video and radio performances. We created a section in the side panel of her blog that includes clickable logos to the websites of newspapers which she has written for. We also included a Broadcast page which allows Rosie to easily upload videos, and radio features which can include links to sound clips. If you like Rosie's new website then you should see what she has to say on Twitter. Gibson Lamb provides personal, value for money, face-to-face wealth management advice. They have been providing a high quality service and helpful, independent advice for nearly 40 years. We recently launched a new website for this wealth management company. They needed a clean site which showed the various categories of their business, along with a cool accordion style meet the team section! As they are London-based, the imagery used on the site is all stunning photography from around the city. We were introduced via Twitter through Richard Allum to David Lamb our lovely client! We have more sites nearly ready to launch, just doing those final tweaks to make them even more perfect! We got a great response from our last newsletter with over 150 requests for our e-book which is why we put it online. We hope to get the same sort of response from you guys with our 3 special offers above. We want to roll up our sleeves and help out where we can! Have a fantastic 2012 and watch out for our next newsletter, where we will report on stats from this one!